Tweaking my UI is by far one of the things I enjoy most about WoW. I love that the game gives so much flexibility on how the interface can look, and it’s something I very much miss in games that don’t allow for add ons. Actually, I think part of my issue with SWTOR was the fact that I couldn’t change around my UI. I was always happy to log back into WoW and see the prettiness that was designed only for myself. My love affair with UI customization began when my friend told me to download Bartender, Xperl, Quartz, and healbot to help out with my play. Over time, my UI has gone from something that I look back on and cringe to see to what it is today. I’ve been using my current UI since the launch of Cata, and I’m still very happy with it. I’m a graphic designer by trade, with a degree in print design. I’ve never been interested in web or interactive design, so originally I found creating a UI a daunting task. After a lot of tinkering and failed attempts, I finally have a UI I’m happy with, and a process for creating it that I think, if perhaps not unique, is interesting all the same. One thing we learned in design school was that we should approach all projects as a problem solving exercise. This is something I kept in mind while creating my UI. After seeing tons of beautiful examples on blogs and on the Add On of the Week column on WoW Insider (which this whole thing was originally intended for, but I was lazy about sending it in), a few things that struck me were that many of the very clean UIs felt a bit sterile and almost looked like something from a sci-fi game. What I wanted was a UI that looked clean but still felt like it fits in a fantasy game. I was pretty confident I could do this if I chose the right colors, typefaces, and textures to support my design. The basic layout of my UI is fairly standard. 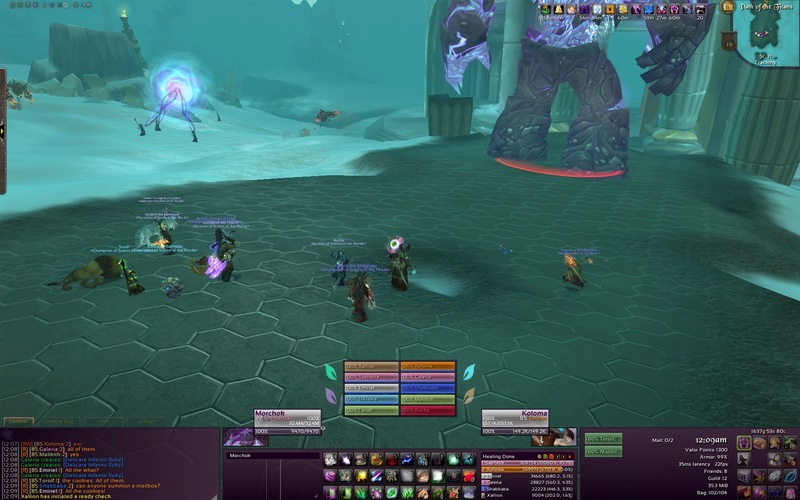 Chat box on the bottom left, action bars bottom center, raid frames centered for my healers, and lower right for my dps. Once I was happy with the placement of everything, I started tweaking it so that it fit my goal of looking like it belonged in a fantasy game. I downloaded STUF after having used Shadowed unit frames for awhile. I instantly liked how much I could customize the look of it, and started playing around with creative ways to approach the look of my frames while still having the information I wanted. Not everyone will agree with me here, but I like knowing exact amounts of health and mana, along with percentages. I know a lot of people aren’t big on player portraits, but I wanted to see if I could include them in my unit frames in such a way that made them fun, and I’m really happy with what I came up with. And I love that STUF will let me use textures as a background on the portraits. Those bar textures were what inspired me to add another criteria to my design. Along with looking like my UI could work in a fantasy game, I wanted to see if I could make it look feminine as well, without it looking like Hello Kitty puked all over my screen. The texture of the bars I used (Glamour 7) has some swirly stuff going on with it, and I decided to use that on all of my bars (Vuhdo, dbm, recount, omen, raven, and quartz all have the same treatment). To keep it from looking overly girly, I made the bars grey, and they fade to dark purple as health gets lower, and I echoed this by having the color of my KGpanels be a dark purple that fades to black. I like the purple also because it contrasts well with most of the settings in the game, so that it’s neither too jarring or too faded. It’s also my favorite color, so I enjoy looking at it all the time. I kept my panels semi transparent as well so that I don’t feel like I’m completely blocking out the game world. My next challenge was finding a typeface that would work well for my design. I’m a type snob (even wrote a 50 page paper about it for an independent study in college) but I recognize that in a video game, there’s a little more leeway for using a fun font. Still, the thought of using something as ugly as Comic Sans makes me cringe, and most of the fonts included with addons are pretty ugly as well. I looked around until I found a type called Sansation, and decided it looked appropriate for the clean, girly fantasy look I wanted. What I love about all of this is that just by changing the textures, colors, and font that I used, this UI can go from looking pretty feminine to something that would appeal to a much wider audience. I will occasionally switch things around for different characters, just to reflect their character better. I like the idea of having fun UI elements, and wanted to include some on my UI but still have them serve a purpose. For my resto druid, I used Power Auras to create a way for me to track cooldowns and add some flavor to my healing frames. The little leaves that you see around the frames help me see when my Wild Growth, Swiftmend, Innervate, and Tranquility are ready to use. I also have an aura set up to help me track Harmony so I know when I need to refresh it. For my paladin, I use Power Auras to tell me which seal I’m using, and the ring of words near my unit frames changes color depending on which seal I have on. The sun and time that are stacked with the Holy Power sword (one of the few elements from the stock UI that I like) help me track Inquisition to make sure its on and that I’m refreshing it at the right time. I have similar auras set up for all of my toons to help keep track of important cooldowns, procs, and buffs, and I try to match the style of the toon to the art that I use for the aura. Despite liking the way that combat text addons like Mics look, I found ultimately the numbers didn’t help me during combat, and actually served as a distraction when trying to not stand in stuff, so I deleted them. In their place, I’m using Raven to track short term buffs and debuffs, along with target debuffs as well. Long term buffs still go up in the upper right hand corner, along with the mini map. I’ve moved the mini map to the bottom of the screen before, but I’m happier with it up top. I changed the default colors on my DMB so that the go from gray to hot pink and also made it so that the placement of the countdown bars would be in a place that I absolutely could not miss it, so I wouldn’t have an excuse to miss an important event during a fight. For my healer, having that go right about my healing bars was imperetive. Vuhdo is my add on of choice for healing because of both its ease of set up and versatility. I keep this running on my DPS characters as well, and use it for utility spells that can help save the day. No idea why the slideshow is cutting off the bottom of the images. Click to see the full thing! DBM Don’t raid without it! GTFO Has seriously helped so much. We ask all of our raiders to use this one so they know when they are, in fact, standing in fire. GupPet I collect pets and mounts, so I love having this addon to help summon random ones. LovelyLoot Skins the loot window. Purely visual and not needed. But it’s nice! Masque (with Darion skin) Makes buttons pretty! MogIt Makes it much easy to know where to look for pretty gear. I mean upgrades. OmniCC Countdown timers on abilities. Have no idea how I ever played with this. Opie Amazing ring ability replacement. I use this to access all of my tradeskills, auras, quest items, and more. Outfitter I like this better than the default Blizzard gear management system. Prat It started with the stupid chant entry box window and not being able to shove it into the corner. Couldn’t handle it, so I had to replace it. Rarity Mount and Pet hunting tracker! WOWScribe This chat logger has been such a huge help to me. I raid a lot, but I also RP, and I love having a record of old RP sessions. As a guild officer, it’s super helpful also to have a record for when their are disputes in /g or /raid.